Union Glashütte stands for affordable luxury. Watches from this Saxon manufacturer stand out with their precision, reliability, functionality, and clear designs. The Union catalog ranges from sporty and modern to classically elegant. Union Glashütte was founded in 1996 as part of the Glashütter Uhrenbetrieb GmbH, which also includes Glashütte Original. However, the brand's roots stretch back over 125 years to 1893, when watch wholesaler Johannes Dürrstein created the "Union" watch factory in Glashütte. His goal was to offer high-quality watches at affordable prices. Union Glashütte remains true to that concept to this day. The current Union Glashütte catalog features six collections: Belisar, Noramis, Viro, 1893, Seris, and Sirona. Belisar and Noramis are the largest and most diverse collections and are comprised of everything from three-hand watches to numerous models with practical complications. This includes chronograph functions, power reserve indicators, outsize dates, moon phase displays, and a second time zone. These watches have functional, modern designs while retaining some of the elements of their classic predecessors. Type 316L stainless steel is the company's material of choice, though they also produce a few gold and bicolor models. Thanks to high standards for materials and finishes, these refined watches have outstanding value for money. Unlike Glashütte Original, this watch manufacturer consistently uses ETA movements. The Swatch Group owns both ETA and Union Glashütte, who joined in 2000. These movements are affordable, easy to service, and time-tested . However, Union doesn't just blindly put these movements in their watches. Each individual movement is inspected, constructed, finished, and regulated in Union's workshops in Glashütte. One exception is the caliber UNG 56.01. Union Glashütte developed this manual caliber from the ground up, and their sister company, Glashütte Original, produces it for them. This movement boasts a 60-hour power reserve and is the driving force behind the 1893 Johannes Dürrstein Edition. 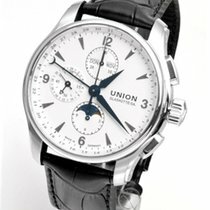 How much do watches from Union Glashütte cost? The Belisar is Union Glashütte's most versatile collection. Its sporty yet elegant lines and 41 to 45-mm cases make it ideal for anyone looking for a larger timepiece that pairs well with a business suit and with jeans and a t-shirt. The most notable feature of this collection is its cases' screwed-down flanks in stainless steel, rubber, or rose gold. You'll also encounter different dial designs ranging from retro to modern, some more technology-focused and others rather classic. This diversity is also present in the complications, which include chronographs, power reserve displays, additional time zones, and moon phase indicators. Prices for a Belsiar fall between 1,700 USD for a simple three-hand model and 4,300 USD for complicated watches with a gold bezel. The Noramis collection takes its inspiration from the style of the 1950s and 60s. A domed dial and applied numerals and indices define this collection. This stylish look is rounded off by practical complications such as an outsize date, chronograph, or power reserve display. This collection also includes one of the few Union watches with an 18-karat rose gold case. Plan to spend anywhere from 1,500 to 2,600 USD on a stainless steel model. For gold watches, that price climbs to around 6,500 USD. Union Glashütte pays homage to the company's beginnings with the 1893 collection. These classic watches use design elements from historic pocket watches, such as the railroad minute scale. The collection's highlight is the Johannes Dürrstein Edition, dedicated to the man who founded the company. The manual caliber UNG 56.01 developed by Union ticks away inside this timepiece and provides it with a date display, small seconds dial, and power reserve indicator. The stainless steel model costs about 2,400 USD. Limited to a run of 25 pieces, the rose gold edition demands around 9,000 USD. This collection also includes watches with a regulator display or small seconds dial. These watches sell for around 1,700 USD. The one exception is the rose gold model with a small seconds dial, which goes for about 6,800 USD. The Viro collection contains a simple three-hand timepiece and a chronograph. Union Glashütte has pared down both models to the bare essentials, giving these stainless steel watches a refined, timeless aesthetic. The three-hand model comes in two sizes: a 34-mm women's watch and a 41-mm men's watch. Both sizes are available with a white, black, blue, or brown dial. Depending on the edition, expect to pay between 1,000 and 1,200 USD. The Viro Chronograph features either a black or white dial and is slightly more expensive at 1,800 USD. The Seris and Sirona collections are geared toward sophisticated women. Both lines are very feminine. Their cases are 36 and 32 mm in diameter, respectively, and fit beautifully on more delicate wrists. Diamonds on the dial and bezel add to the elegance of these timepieces. You can tell these collections apart by how they display the seconds: The Seris uses a small seconds dial, while the Sirona is a classic three-hand watch with a central seconds hand. You can find simple stainless steel models in both collections at prices starting around 1,200 USD. However, diamond-studded pieces can easily cost over 3,400 USD. It's also worth checking out the predecessors to the current collections. Union outfitted these watches with calibers from the 26 series until 2008. These movements were developed in-house and manufactured by the Glashütter Uhrenbetrieb GmbH in the same production halls as Glashütte Original's lauded in-house calibers. These collections bore names such as Diplomat, Sport, Tradition, and Classic and were very similar to their successor models both visually and in terms of features. Their focus was also on design and functionality. You can purchase well-maintained models with three hands and a date display for as little as 1,100 USD. Watches with a chronograph function or moon phase display begin around 2,200 USD. Complicated timepieces like the Diplomat Perpetual Calendar with a perpetual calendar, moon phase display, and outsize date require a much larger investment of about 7,000 USD. The history of Union Glashütte stretches back over 125 years and is inseparable from Johannes Dürrstein (1845-1901), a watch wholesaler from Dresden. Dürrstein spent 20 years successfully selling watches – he was even A. Lange & Söhne's official distributor. He recognized the potential market for high-quality yet affordable consumer watches. Thus, he began having Swiss pocket watches produced under the label "Union" in 1880. That was followed in 1893 by the foundation of a watch factory in the small Saxon town of Glashütte, which had already emerged as the center of German watchmaking. Dürrstein appointed master watchmaker Julius Bergter (1856-1944) as technical director. In 1900, Bergter completed his magnum opus: the Universal Watch. This timepiece contained 18 complications and long held the title of the world's most complicated watch. However, such extravagant creations are the exception. 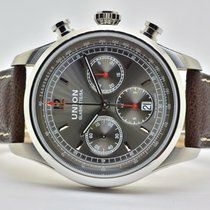 In general, Union has always concentrated on producing everyday watches for your average person. Any additional complications are always practical, such as the chronograph, power reserve display, or date. The brand was able to quickly establish itself and found plenty of customers throughout Germany, Austria, Bohemia, and Switzerland. However, the economic crash of the late 1920s hit the company hard, and they soon had to file for bankruptcy. The Union watch factory was struck from the commercial register in 1936. Exactly 60 years later, Union Glashütte was given new life as part of the Glashütter Uhrenbetrieb GmbH. In keeping with Dürrstein's original concept, this brand's watches remain a cost-effective alternative to the markedly more expensive luxury watches made by their sister company, Glashütte Original. The Glashütter Uhrenbetrieb GmbH and Union Uhrenfabrik GmbH – and thus Union Glashütte and Glashütte Original – have belonged to the Swatch Group since 2000.